The company blames its bookings shortfall on “several large deals that were forecast for the quarter that did not come through,” with ITWorks complete outsourcing providing deals being a big contributor to the shortfall. Cerner notes that the lack of Meaningful Use-driven customer urgency is making it harder to create reliable sales forecasts. The company expects to sign its contract with the VA by the end of the year, in which Cerner will function as the prime contractor with subcontractor partners to be announced later. President Zane Burke expects that the VA contract terms will involve a series of task orders that will provide percentage-of-completion payments over several years. Cerner shares dropped 8.43 percent Friday after the earnings report. Above is the five-year share price of CERN (dark blue, up 68 percent) vs. the Nasdaq (light blue, up 125 percent). From Snowman: “Re: Citrix. Hearing 40 percent increases in maintenance fees when renewing. That’s another $300,000 per year for our medium-sized facility. Does that make them a monopoly?” Unverified. Anyone else seeing big maintenance jumps? Citrix isn’t exactly a monopoly since alternative virtual desktops exist, but its product is deeply embedded into the infrastructure and software vendor contracts of most hospital IT shops. I would be interested to hear from hospital CIOs who switched successfully from Citrix to something else for their core healthcare-specific apps and whether they experienced support issues. From IT Maven: “Re: University of Washington. UW Medicine has had three chief health system officers in less than a year. Does this have anything to do with their decision no to go with Epic?” I doubt Epic was a key consideration for an executive of that level. The new CHSO’s predecessor lasted less than a year before stepping down in a mutual decision, replaced by an interim that I assume the reader is counting as the third person to hold the job since November 2016. From Master of Startup Puppets: “Re: Crunchbase series. I think HIStalk readers would enjoy it.” The series called “A Startup Takes Flight” is an interesting fictional case study that covers early-stage funding, venture capital deal terms, and what happens when a startup sells. From Not A Client: “Re: Medi-Span data. Has been removed from RxNorm at the request of Wolters Kluwer. Not sure if this is newsworthy since I’ve seen nothing outside the NLM site.” The October 2 RxNorm release notes verify that Medi-Span data was removed from RxNorm at the company’s request. NLM has just announced that the September 2017 RxNorm release expanded the Medi-Span data set. From The PACS Designer: “Re: LiFi Mobile. LEDs can act as transmitters of signal in wireless systems. LiFi is high speed, bi-directional networked and mobile communication of data using light. LiFi comprises of multiple light bulbs that form a wireless network, offering a substantially similar user experience to Wi-Fi except using the light spectrum.” It sounds interesting, but line-of-sight requirements, as well as possible interference from ambient light, would seem to limit usefulness. Poll respondents are mostly skeptical that IBM Watson will make a healthcare splash. New poll to your right or here: which ambulatory EHR vendor has fallen hardest from HIT front-runner status? I recognize that Allscripts and GE Healthcare aren’t just ambulatory EHR vendors, but their presence there earns them a poll spot. For those with short memories or short healthcare IT careers, it’s time to relearn the oft-repeated lesson that big companies dip their toes into and out of the healthcare IT waters all the time with little loyalty to anyone except shareholders. McKesson bailed out this year and now GE is apparently mulling its exit after wrecking a slew of acquisitions over many years. Siemens is long gone. Nothing good ever comes from conglomerates licking their chops at what they naively think is easy money and higher growth than their other verticals (see also: Misys and Sage). How hard could this healthcare thing be? A poor McKesson earnings report sends shares down 23 percent, while competitors Allscripts and Cerner also post lackluster earnings. A Politico article says that Epic and EClinicalWorks are impeding data-sharing with public and specialty registries. CMS approves continuous 90-day reporting period for its EHR Incentive Program and eliminates specific objectives and measures. McKesson talks up its MedVentive and MED3OOO acquisitions in its earnings call, hints that the company might work with Athenahealth following its acquisition of PSS World Medical, and admits that some Horizon customers are passing on the chance to migrate to Paragon. A Wells Fargo Securities analysis finds that the lowest-percentage hospital EHR attestation vendors are GE Healthcare, QuadraMed, NextGen, and McKesson. CHIME President and CEO Rich Correll announces plans to move to a COO role. SCI Solutions founder John Holton retires from the company. Humana acquires Certify Data Systems. CSC acquires First Consulting Group. Perot Systems conducts massive layoffs. ZDNet declares MIsys to be an open source health IT competitor to Medsphere. ONC funds a significant grant to have definitions developed for the terms EHR, EMR, PHR, HIE, and RHIO. Virtua Healthcare (NJ) says its $500 million, 368-bed new medical campus will use technology to transform healthcare. Philips announces plans to sell its 70 percent stake in MedQuist. Cerner falls short of Wall Street expectations for both revenue and earnings in its quarterly report, sending shares down hard. CVS is rumored to be in talks to acquire Aetna. GE explores selling its healthcare IT business. A second former executive of Cleveland Clinic Innovations is arrested for fraud involving spinoff Interactive Visual Health Records. 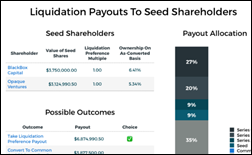 The company says it was hit by turnover in its sales team as “a number of legacy sales resources and managers elected to move on,” with the resulting loss of client relationships hurting the close rate for larger deals. The company confirmed that 13 of 70 salespeople have left and have been replaced. The company is still trying to salvage one unnamed large client that has threatened to defect. NextGen is emulating Athenahealth in offering pricing based on a percentage of net collections. Above is the five-year share price of QSII (dark blue, down 19 percent) vs. the Nasdaq (light blue, up 125 percent). Tenet Health will lay off 1,300 employees. 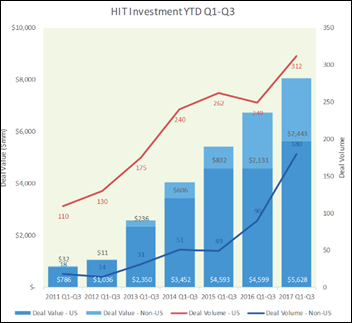 A Healthcare Growth Partners report finds that health IT investment is continuing at a record pace even as M&A activity has stagnated. The quarter’s big M&A deals were the merger of Navicure and ZirMed, the sale of The Advisory Board Company’s healthcare business to Optum Health, and the sale of WebMD. The big investment theme was genomic medicine. The article notes that the industry must be assuming that total addressable market and M&A activity will increase to absorb the 46 percent annual growth rate in investment that has occurred since 2011. Everest Rehabilitation Hospitals (TX) chooses Medhost for two hospitals to be constructed. Aviacode CEO Keith Hagen takes on the additional role of board chair. Medecision launches 10 care management apps for care, utilization, and disease management; network management; and care coordination. 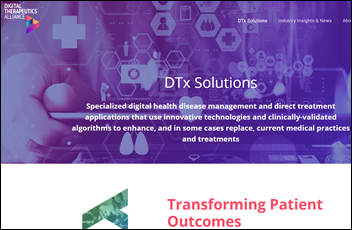 T-System says 70 percent of its new contracts involve its hosted solutions for episode-based care, which includes hospital EDs, freestanding EDs, and urgent care centers. Definitive Healthcare adds retail health clinics and assisted living facilities to its healthcare provider database. Akili Interactive, Propeller Health, Voluntis, and WellDoc launch the Digital Therapeutics Alliance to support clinically validated solutions. Drug maker Merck says it lost $135 million in Q3 sales and spent $175 million in direct cost due to its Petya ransomware attack in June. The company said in the earnings call that its Q4 results will be similarly impacted, raising the cost of its ransomware attack to at least $620 million. 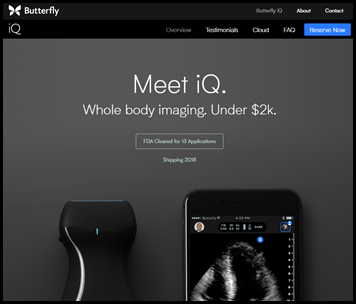 A vascular surgeon testing the FDA-cleared Butterfly IQ ultrasound device for smartphones decides to scan his sore throat, the result of which reveals that he has a since-treated cancerous mass. 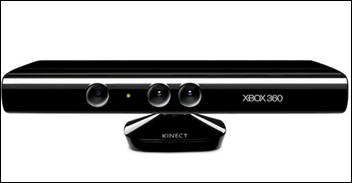 Microsoft ends production of its Kinect 3-D mapping and body movement sensor that in addition to is main purpose as an Xbox game controller was used in some healthcare applications, such as those for physical therapy, rehab, and health screening. Part of Kinect’s technology has been rolled into Microsoft’s Hololens. 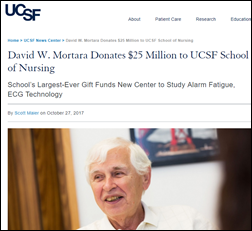 Medical device executive David Mortara, PhD donates $25 million to the UCSF School of Nursing to fund a center that will study alarm fatigue and overly sensitive ECG machines that contribute to it. Mortara sold his diagnostic cardiology and patient monitoring device company to Hill-Rom for $330 million in cash in January 2017. 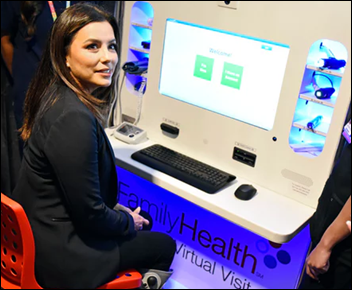 Actress and investor Eva Longoria helps introduce a virtual visit kiosk that will be offered to residents of an affordable workforce housing community in Texas. 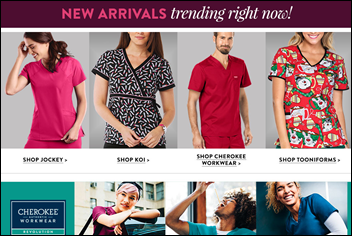 An interesting article looks at the big business of scrubs, worn every day by the nearly one in five Americans employed in healthcare who generate $10 billion in annual sales, mostly to wearers who buy their own. The latest innovation beyond adding licensed cartoon characters and form-flattering designs: scrubs impregnated with antimicrobials to help reduce the spread of infection. In Scotland, the Royal Pharmaceutical Society says community pharmacists don’t have access to the electronic medical records of patients as they were promised, requiring them to call an NHS hotline to obtain the information they need. Thomas Health (WV) lays off 10 IT employees following consolidation of systems it didn’t name. The hospital announced plans last year to move from Cerner/Siemens Soarian and Meditech Magic to Meditech 6.1. Weird News Andy is weirded out by this story covering the largely unregulated “tissue banks” that offer free cremation – sometimes in cahoots with funeral homes who invest in the companies — in return for donating organs to “advance medical studies.” It calls out Southern Nevada Donor Services, whose employee was caught using a garden hose in the parking lot of its warehouse to thaw a human torso, sending tissue and blood into a gutter. 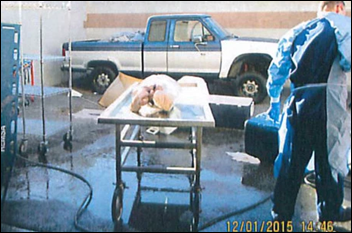 Most of the known “body brokers” are for-profit companies, one of which earned $12.5 million in three years. The companies were launched for as little as the $100,000 needed to buy a van and freezers, with some of the more frugal ones using a chainsaw instead of the much more expensive surgical saw to disassemble their donors into marketable components. Vince takes us back to November 1987, when pre-adult Tiffany (who is now 46 years old) ruled the pop charts with “I Think We’re Alone Now” and a surprising health IT vendor’s ad bragged on being backed by a $5 billion company (which, like most big companies dabbling in healthcare, didn’t stick around long). Forward Health Group founder and CEO Michael Barbouche is named to Madison Magazine’s M List of health innovation leaders and will speak at a reception and dinner on November 9. ZappRx will attend the CHEST conference October 28 – November 1 in Toronto and the North American Cystic Fibrosis Conference November 2-4 in Indianapolis. The company will also exhibit at the PFF Summit November 9-11 in Nashville. Aprima will exhibit at the American College of Phlebology’s 2017 Annual Congress November 2-5 in Austin, TX. Surescripts will exhibit at the Digital Quality Summit November 1-3 in Washington, DC. T-System sees swelling demand for its hosted healthcare solutions. TriNetX will exhibit at the AMIA Annual Symposium November 4-8 in Washington, DC. Mazars USA elects Cody Cass, Julie Petit, and Kristen Walters partners. The Boston Globe features ZappRx CEO Zoe Barry in a profile on women in technology. Did anyone see the company’s new client bookings number? It was down an astounding -32% YoY, with the prior negative too. Their new client bookings number comes from them displacing competitors in the EHR market. Clearly, they are getting hit by the slowdown in the EHR market like everyone else. Can’t believe management blamed the shortfall all on ITWorks and Managed Services contracts when those are contracts from existing customers. Proclaiming anything as a “fake rag” while obviously continuing to read and interact with it perpetuates the unfortunately now-common “I don’t like it, so I’m putting my fingers in my ear and declaring that it isn’t real” aproach. But you are still correct that while I didn’t think of ECW, they’re a good candidate and I’ve added them. I was originally thinking of publicly traded (now or previously) companies along with Practice Fusion, whose planned IPO never materialized. It may be negative but also true that the post-MU environment is going to be tougher for some former high flyers and that’s probably a good thing overall. Anyone from Cerner making statements like “have over-promised and under-delivered.” about other companies is just pure arrogance and a complete lack of self-awareness. Talk to a few of their customers that are implementing and using Cerner consultants and you will find out what I mean. They consistently over-promise and under-deliver. It is so bad, they should not be in the implementation business. At all.